I haven’t posted FarmBox picture recently, and since they started offering new items, I wanted to make sure to give an update! They now are offering items like oats, lentils, peas, raisins, and other items from their sister company, One Degree Organic Foods. Plus, they provided us with a copy of a new magazine, Edible Baja, which is all about food and drink in southern AZ. It’s a really neat magazine! The carrots and radishes have been great snacks, and I’ve been on a salad kick lately, so the green leaf lettuce is perfect for salads for lunch. I think I will be making oatmeal raisin cookies with the oats and the raisins, that is, if I don’t eat all the raisins first! 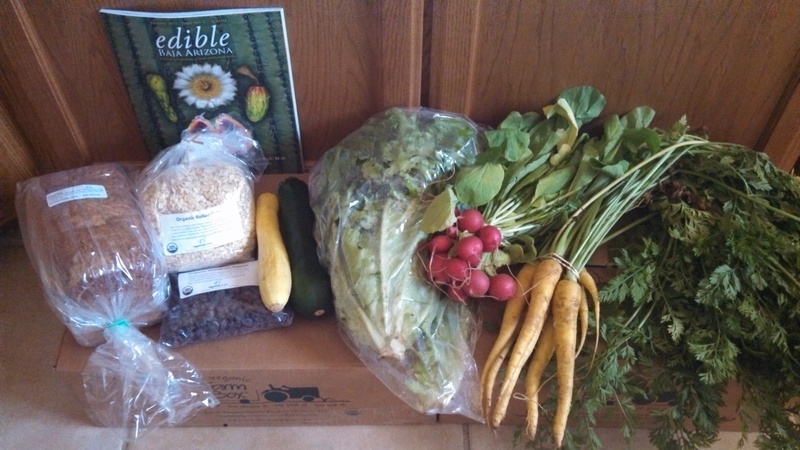 Still love getting fresh food from them, and happy to hear that they are partnering with farms with the same quality values as them to be able to provide more for us who participate in the program. Looking forward to them offering peaches again soon from a local grower, last year they were amazing! I know I haven’t done this in a while, even though I still get a Farm Box weekly. 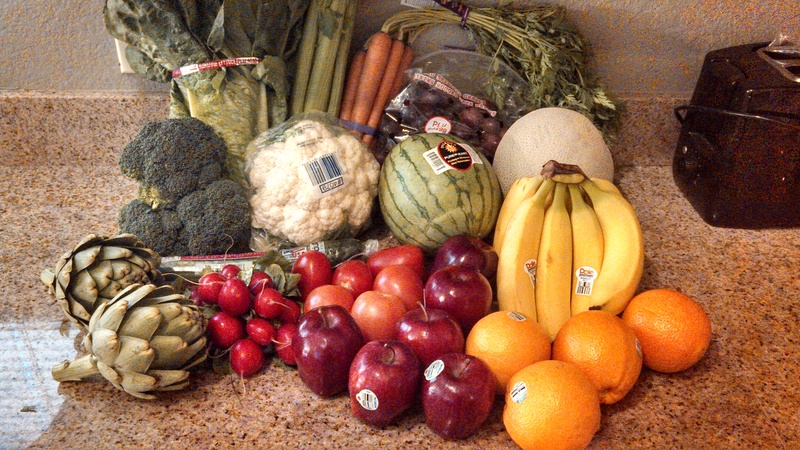 But, this week, I was very excited about my box, so I just wanted to share! – Green beans: My 4-year-old and 6-year-old LOVE green beans and can’t get seem enough of them right now! – Beets: Making pickled beets and using the water from boiling them to color Easter eggs, hoping it works! – Radishes: Kids and husband love them! 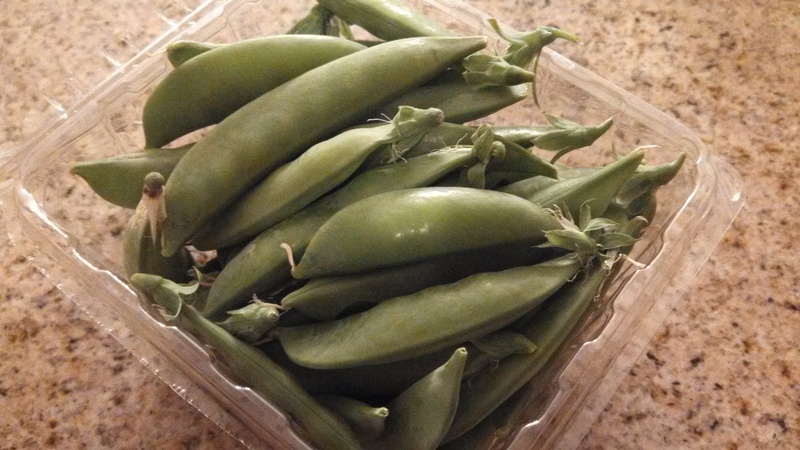 We love peas, but they are usually so expensive or hard to find at the store, and they never seem to make it into the Bountiful Baskets rotation. So, I was very excited to see them available through Sunizona. 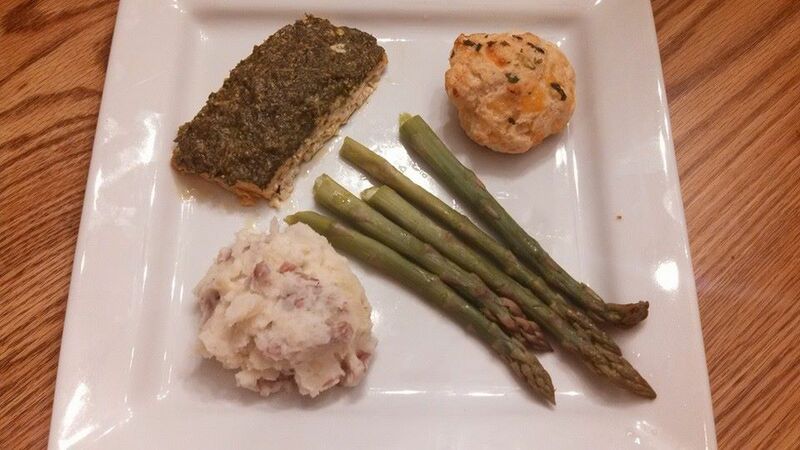 And, they are delicious! We will probably eat these raw. I got okra (thank you Gayle for sharing! 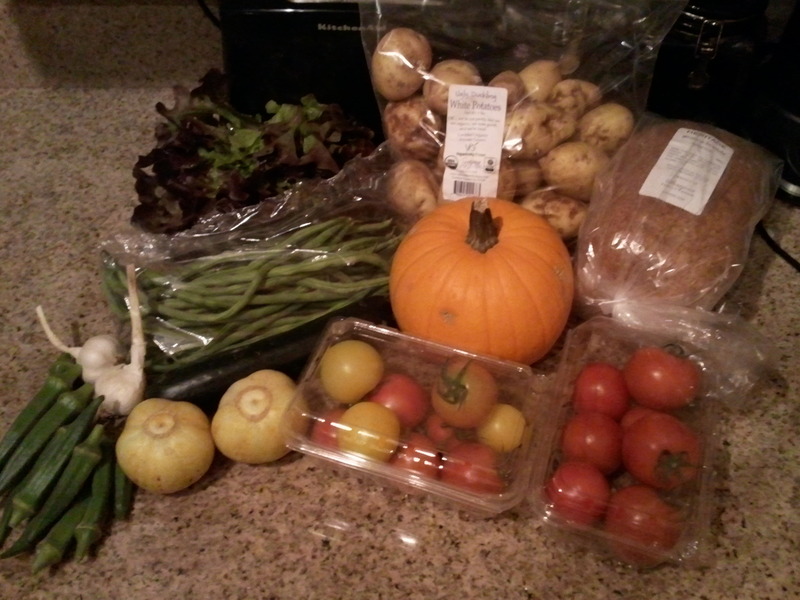 ), garlic, red leaf lettuce, green beans, zucchini, lemon cucumber, ugly duckling potatoes (not the prettiest potatoes, but still edible), kid size pumpkin, red & yellow cocktail tomato mix, Special Spelt bread, and red cocktail tomatoes. The pumpkin I will bake and puree at some point for my favorite fall pumpkin recipes. We’ve been munching on the tomatoes. The spelt bread was one he hadn’t tried yet, and it was great. Very light, fluffy, moist bread. They do any amazing job with their bread! Now, it’s time to work on what to get for next week! 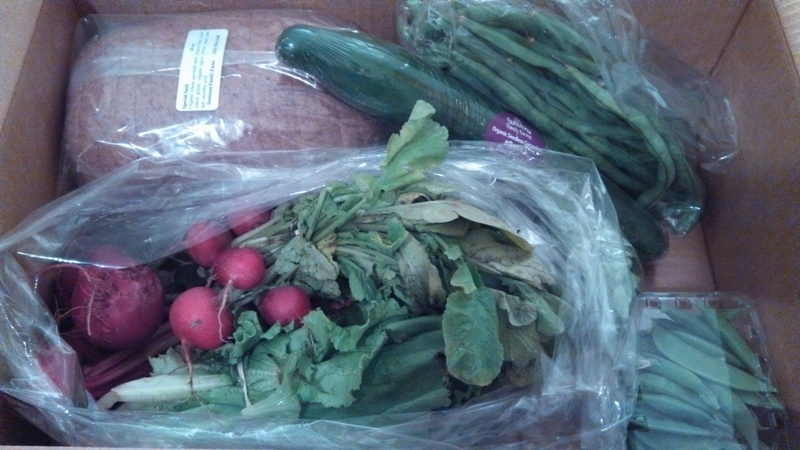 This week, I was excited to have 14 other people get FarmBoxes! Slowly keeps growing here! 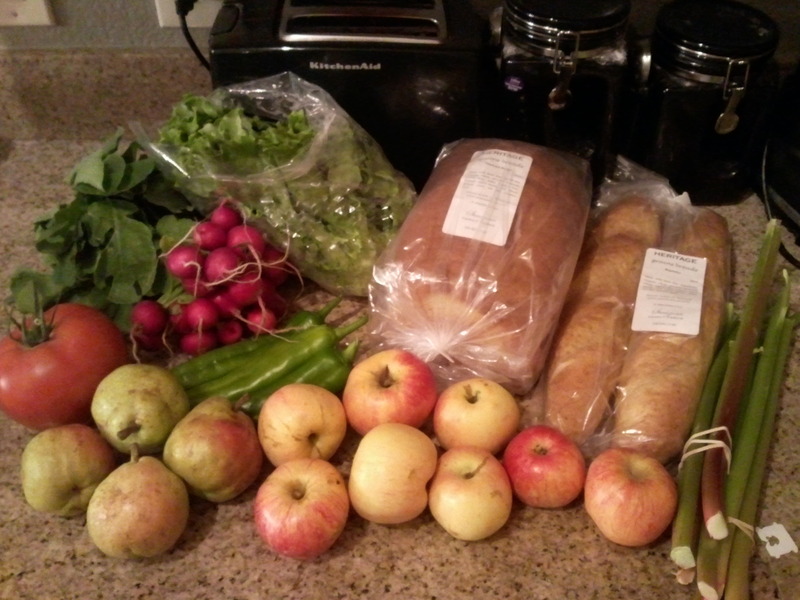 This week, I chose radishes, the big ol’ beef tomato, Bartlett pears, green leaf lettuce, green chile peppers, Gala apples, Khorasan sandwich bread, baguette, and rhubarb. 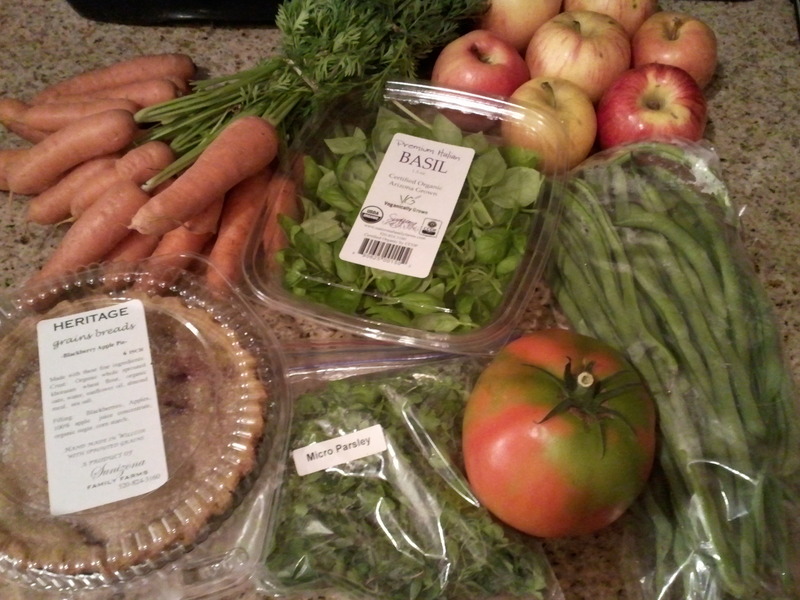 I’m really looking forward to making something with the rhubarb, pie or a crisp, maybe with strawberries. My girls are loving the pears and apples, and will devour the radishes. I used the bread and tomato with some cheese for a grilled cheese and tomato sandwich. The baguette is really good as well, I might spray with olive oil, rub with garlic, and broil it. Or, just eat it, it’s great like the rest of their bread. I realized I never did post last week, so, I waited until I got yesterday’s box so I could just post them together. 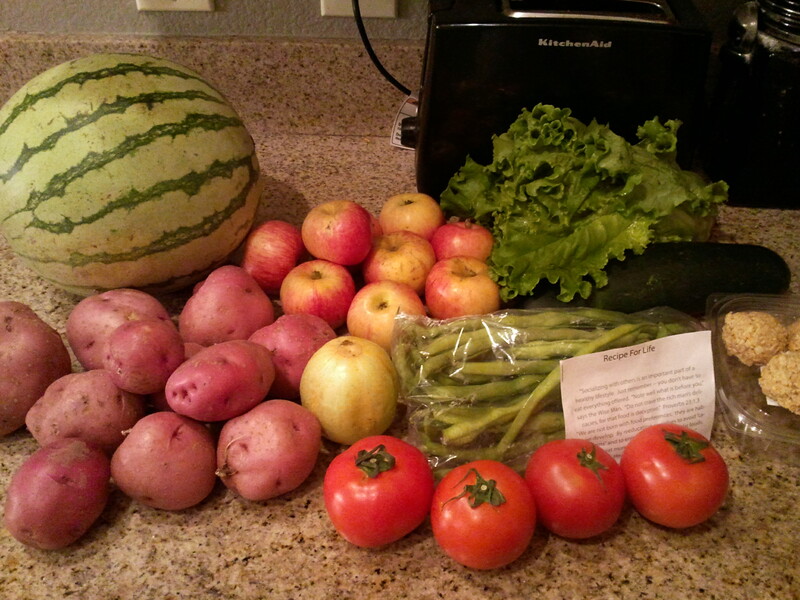 Watermelon, red potatoes, Gala apples, a lemon cucumber, green leaf lettuce, zucchini, green beans, 1 pound vine ripened tomatoes, and coconut macaroons. 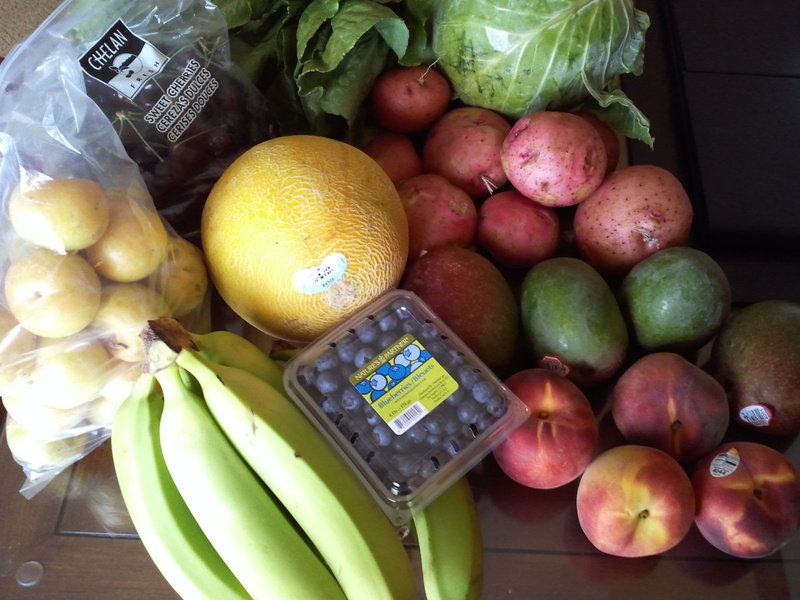 All of this was $28.75. Coconut macaroons are one of my favorites, and these 3 got eaten in no time! I made garlic green beans with the green beans, my daughter took sliced lemon cucumber to lunch one day. The tomatoes I used to make a tomato mushroom pasta sauce, and the zucchini made Zucchini Chocolate Chip Muffins. The head of lettuce made a couple of great lunch salads for me. I got 2 head of lettuce (yes, I love to make salads! 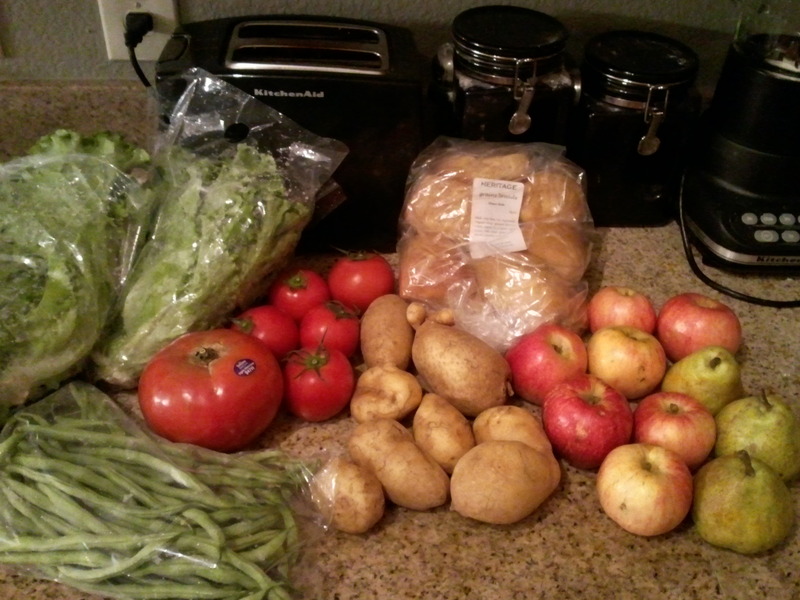 ), green beans, big ol’ beef tomato (GREAT addition to grilled cheese or perfect for BLTs), 1 pound red vine ripened tomatoes, white potatoes, dinner rolls, Gala apples, and Barlett pears (apples and pears are from Briggs and Eggers orchard, which is also organic). One daughter had a pear, the other an apple in their lunches today. I put the dinner rolls in the freezer, we’ll have those soon, but I didn’t want them to get moldy. Excited to make green beans again, and the white potatoes are great boiled in salt as a side with dinner. 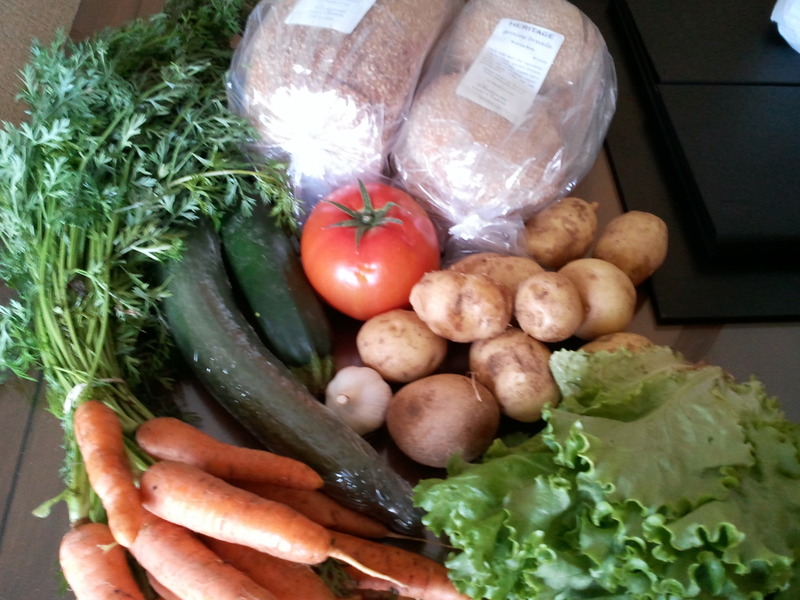 Recently, I’ve been able to get fresh dill in my Sunizona Family FarmBox. Cucumbers have also been available through them, and on sale at the grocery store. My husband and kids love pickles, and while I had made sweet Refrigerator Pickles before, my older daughter has decided she isn’t real fond of sweet pickles. So, I decided to try dill pickles. I am not a pickle fan at all, but I do really like these! Make the brine by dissolving the sugar and salt in hot water. Mix in white vinegar. 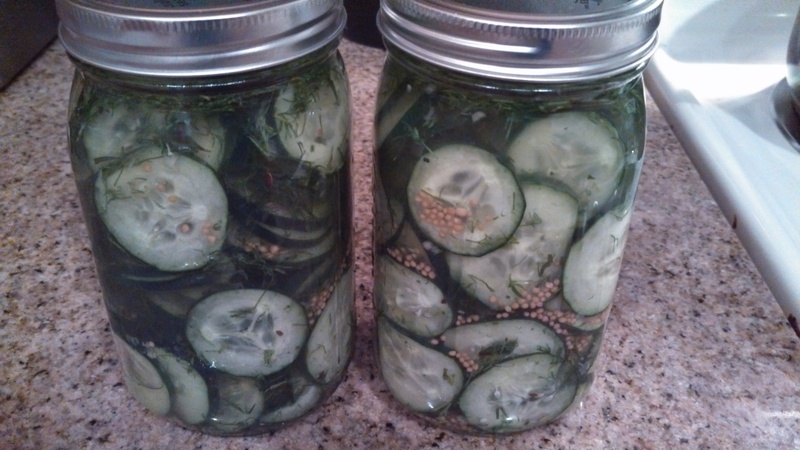 Divide the cucumbers, mustard seeds, fresh dill, and garlic between 2 quart size jars. Shake or stir slightly to get the mixture evenly through the jars. Pour brine into both jars, making sure the cucumbers are fully submerged. Tightly cover with lids and place in refrigerator. Allow to sit for 48 hours, and keep stored in the refrigerator.